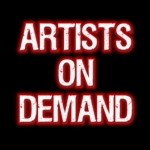 Artists On Demand allows the fans to have a one on one experience with their favorite artists and celebrities. It allows up and coming artists to have a voice and a place to share their talents with the world. We thrive on the fact that we are a one of a kind show. We keep our interviews laid back and fun while still getting all the details that make the fans keep coming back for more.